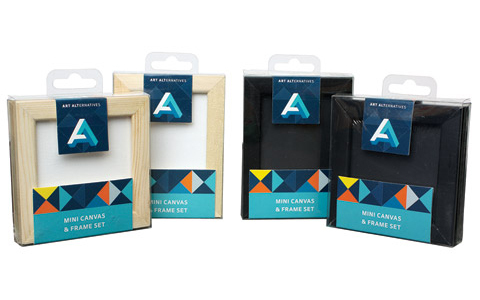 These miniature gift sets contain one mini canvas and one perfectly sized frame. They are available in two sizes - 2½" × 3½" and 3" × 3". White-primed canvases come with a natural pine frame and the black-primed canvases come with a black wood frame. The canvas is made with the same acid-free, acrylic primed cotton as the larger Classic Stretched Canvases and are suitable for use with all acrylic paints, oil paints and other wet or dry media. Once completed, the mini art can be hung or displayed on Mini Easels.